Just looking at this picture makes me want another kakigori! Miso An Kashiwa Mochi: it’s finally spring! I’ve started to count the seasons here by not the weather, but the appearance and disappearance of Japanese sweets, wagashi from the local grocery store. I have one weak spot for wagashi devoted wholly to kashiwa mochi　柏餅,which is rice cakes formed into a pancake like shape, and filled with a sweet bean paste, then wrapped in a oak or kashiwa leaf. The sweet is associated with Children’s Day 子供の日 in May. I specifically love the ones filled with a mixture of miso an, or sweet white bean paste mixed with a small amount of salty Saikyo miso paste. From the middle of April, I start to keep an eye on the wagashi corner of the grocery store, and do a little happy dance when I spot them for the first time in the season. Because these sweets definitely have a season! Wait more than a few days after the 5th of May, and you’ll have to wait another year before they come back. While I like red bean mochi, and generally enjoy the taste of sweet bean paste, sometimes the tooth aching sweetness can be a bit too much even for me. Miso an filled kashiwa mochi is at once sweet and salty, the miso paste lends a depth of flavor missing from regular red bean paste, making the filling taste almost creamy. I guess adding the miso to the filling is the same concept as adding flaky sea salt to a chocolate cookie, or salted caramels, the salty taste accenting the taste of the white bean paste and preventing the filling from being overly sweet. It’s difficult even in Japan to find wagashi shops that still make miso an kashiwa mochi, but if by chance you do find a place selling them, please give them a try! Though Nagoya is a bit lacking in major sightseeing destinations, it makes it up by having plenty of food destinations. So onward to the tour! Japan has never had a shortage of cute animal shaped food, but I always seem to forget to take a photo before munching on an adorably shaped ear. Last Friday, I managed to hold off my baser instincts for the 5 seconds it took to snap a photo of two bear shaped buns before they met their demise. I spotted this rainbow panda bun at the local convenience store. Next, I went to Mister Donut for my next victim snack. I live in a part of Japan known for their grapes, specifically a dark purple variety called Kyoho. So it’s not uncommon to see signs advertising everything from grape juice to grape cookies to grape ice cream. However, when I was on the way to work on Monday, the main street of my town had suddenly burst into bloom with white flags advertising Kyoho grape bread. Grape bread, made with local grapes at a local bakery in small quantities. The very definition of a local limited edition specialty, and you all know how much I love all things gentei♥. The grape bread comes in two varieties, a mini loaf of standard raisin bread, and melon pan shaped like a bunch of grapes. I raced over today after work, and managed to grab two grape melon pans from the shelf just before a neighborhood granny purchased the rest of the stock. Melon pan is a popular type of bakery bread which is covered in a layer of cookie like crust. This melon pan consisted of small balls of fluffy bread studded with giant Kyoho raisins, arranged like a bunch of grapes, covered in a grape flavored cookie crust and decorated with a pretzel stick as the stem. 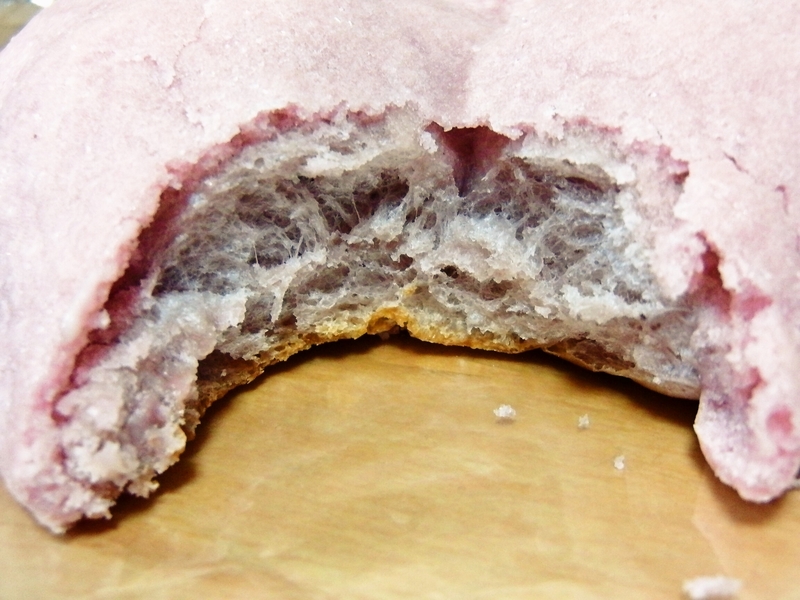 A bite revealed the inner bread to be nearly as purple in color as the cookie crust. This little frog is actually made of cheesecake! The body is composed to a creamy lemony cheesecake, and filled with pieces of fresh fruit, and decorated with chocolate. The “lilypad” is a semi-sweet choclate biscuit, and the leaf is well, a leaf. The description was winter themed, so right after i took this photo, our ninja for the evening came by and sprinkled parmesan cheese “snow” over the frog. It felt a bit wrong digging into this guy…but I finished every last bite! Appearance aside, I love this recipe! These slightly sweet and salty pork filled gyoza based off of my mother’s guotie filling recipe. 1. Combine all ingedients other than the gyoza skins in a large mixing bowl. 3. Wrap gyoza. If you don’t know how to wrap or cook gyoza, About.com has a great tutorial here. I always double this recipe and make a batch to pop in my freezer. You can cook frozen gyoza the same way as fresh gyoza.